As I wait for one or two games to launch in the AppStore, I thought that it’s a good time to figure out how other developers/publishers are able to track their launch as it goes live. It turns out that it’s not rocket science, but it is tedious if you don’t have a system. This article will remove the tedium and let you focus on the stuff you care about: which AppStore will my app get launched in next? As of this writing, there are 90 AppStores. All of them have their own featured apps list, feature sections, and so on, and all of them ‘go online’ with new releases more or less separately (we’ll get to that in a minute). When you specify an exact release date for your app, what you’re saying to Apple is that when an AppStore (from my list of territories that I want to release in) gets to that date, launch it for sale. This means that whenever midnight rolls around in that AppStore, that’s when it appears for sale. When the midnight hour strikes, you can look at each AppStore separately and see that your app is available for purchase. To look at a specific AppStore, all you need to do is click the flag icon in the bottom right of the (computer) iTunes. You’re then presented with the list of other AppStores. Simply click on the one you want, and then do a search for your app as normal. If it doesn’t appear in the search results, that probably means that particular AppStore hasn’t updated yet. Just keep trying again periodically; it will appear eventually. NOTE: Don’t expect a steady march across timezones like it’s New Year’s eve. The AppStores get the new data in random order. Now, the real key to all of this is knowing which AppStores to look at and what time their midnight is for you. Since there are 90 AppStores, this is a real pain to do it manually. What I did was create a spreadsheet that lists out each AppStore based on which midnights happen first. I also have a handy column that tells you when to check based on the timezone you’re in. Everything is based on UTC. Since I am on the east coast, that is UTC-5. Therefore, “UTC midnight” for me is 7:00pm (19:00). That appears in C1 as a TIME() function. (For me, that cell’s contents is “=TIME(19,0,0)”.) 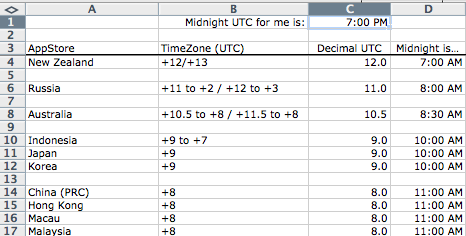 When you change that to your own time zone, all of the cells in column D change appropriately. In the B column, you’ll sometimes see a set of numbers after a /. If it’s in a cell, that means that country observes “summer” clock changes. The new time zones are noted. Also, for really wide countries, they span more than one time zone. The AppStore doesn’t care and treats the entire country as if it was all contained in the first time zone listed. Note: Because I didn’t want to spend a ton of time on the sheet, I didn’t bother to make any reference to release dates, only times. It is an exercise for the reader to add that if you need that info. Also, it is assumed that you know that 7:00am (cell D4, for example) is the *morning before* the launch date you specified in iTunes Connect. Here is the sheet I created. Feel free to edit it as you see fit.